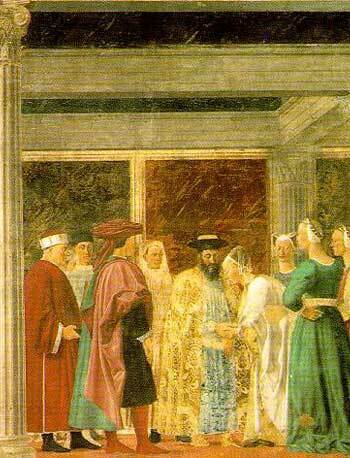 Detail from a fresco of Solomon meeting Sheba, by Piero della Francesca. See the full image here. Certain of the scribes and Pharisees answered him, saying, "Teacher, we would like to see a sign from you. But he answered, "An evil and adulterous generation seeks a sign . . . . The queen of the south will rise up in the judgment with this generation, and will condemn it: for she came from the ends of the earth to hear the wisdom of Solomon; and behold, one greater than Solomon is here." 1 When the queen of Sheba heard of Solomon's fame, she came to Jerusalem to test him with hard questions. Arriving with a very great caravan�with camels carrying spices, large quantities of gold, and precious stones�she came to Solomon and talked with him about all she had on her mind. 2 Solomon answered all her questions; nothing was too hard for him to explain to her. 5 She said to the king, "The report I heard in my own country about your achievements and your wisdom is true. 6 But I did not believe what they said until I came and saw with my own eyes. Indeed, not even half the greatness of your wisdom was told me; you have far exceeded the report I heard. 7 How happy your people must be! How happy your officials, who continually stand before you and hear your wisdom! 8 Praise be to the LORD your God, who has delighted in you and placed you on his throne as king to rule for the LORD your God. Because of the love of your God for Israel and his desire to uphold them forever, he has made you king over them, to maintain justice and righteousness." You might want to review yesterday's reading if you missed it or have forgotten it. The Hebrews used the term "adultery" to describe conduct that would make them unclean under the First Covenant, especially forbidden contact with Gentiles. They frequently analogized their relationship with God as a marriage, and thus engaging in forbidden conduct with non-Jews (such as eating a meal) was conceived as adulterous in the sense of marital infidelity, as well as the sense of "adulterated" (allowing impurities to contaminate a substance). A very good example is the second chapter of Hosea, a poem comparing Israel to an adulterous wife, who gives homage to Baal for the earth's fruits. The passage also reiterates a theme previously visited by Christ: the acceptance and importance of the Gentiles in the New Covenant. As he did in yesterday's passage concerning Ninevah, he speaks favorably of righteous Gentiles, at the same time condemning the non-believing Pharisees.